Ten more miles and I'm still here. 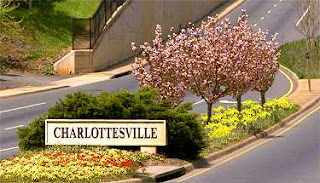 I survived the 2008 Charlottesville Ten Miler, its 33rd running. The preparation was immaculate, of course. No training, unless you count the four-month taper. I stayed with my friends Dean and Maurie the night before, and ate a delicious seafood gumbo, together with their friends Tim, Christy and Sandra. Tim was running in the morning too. Dean insisted that as I wasn't really racing in the morning, just jogging, I should have a drink. I conceded to half a glass of pinot noir. Dean found a 16 oz glass, and carefully half-filled it, so a couple of those later and I was well hydrated. Instead of my usual evening-before meticulous kit preparation and pinning of number to shirt -- hard to do, given that I didn't bring an appropriate shirt, not knowing that I was going to be racing -- I went to bed, wrote emails and read Robert Lowell's correspondence. The bed was very comfortable, however, and I did manage a few hours' sleep. I rose in the dark and ate instant oatmeal, drank some coffee, wrote more emails and read Robert Lowell and pondered the problem of the shirt. I really wanted to wear my C&C vest, so I would look fast, even if I was going to be slow. Dean lent me a shirt, which meant that I was running a race with a brand new, unworn pair of shoes and a shirt I'd never worn before. The gel in my shorts pocket was leaking. I didn't even bother with the watch. Dean is a man of action, and meticulous in his organisation. At 7:10 he announced we would be leaving at 7:15. I pinned my number, 2395, to the shirt. At 7:15 he bundled me into the lexus and drove me to the start, without baggage, warm clothing, or a race plan, but with intensifying nausea. At 7:24 he bundled me out of the lexus 200 metres from the start at the John Paul Jones stadium. He went home to nurse his hangover; I went to find a toilet, successfully as it turned out. The start was clearly marked Start. All the slow people moved instinctively to the back (contrast other entries in this blog). In front of me were a bunch of guys wearing vests. They had trained, and looked fast. Someone sang that song about the flag. The weather was cool and clear, and the light warm and full of life. The gun fired at 7:45. We started uphill. There were many more uphills to come, and downhills too. There were no mountains, but plenty of foothills to foot up and down. I reminded myself that I was meant to be having fun. No watch, just the tell-tale beating of the heart. I fell in behind a bunch of women. I can usually keep up with women. Falling in behind other runners means that you don't have to concentrate. And women have less testosterone than men, which means that they're more likely to run sensibly (this is founded on extensive empirical observation). After about half a mile I developed shinsplints, really painful shinsplints. I saw I wasn't going to be able to finish. They went away after a couple more miles, I think. The first mile came up in six-twenty-something. Perhaps this wasn't such a good idea. Then, when I heard someone call out "first woman", I realised the magnitude of my error. This only diminished slightly when other spectators called out, correctly, "second woman". There's little else to tell. 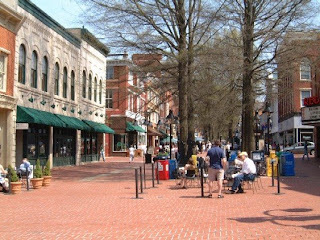 The course is a hil ly and very attractive one, which loops through part of the university campus before swinging through the brick-paved streets of downtown Charlottesville. The marshalling and the water stations were impeccable. At five miles I was feeling ok. I was watchless, but it went through in 32-something, much quicker than I had intended. I stayed behind the pack of women (diminished by the fact that one of the four had surged ahead) until about six and a half miles, when I foolishly decided to press on ahead. I regretted this almost immediately, though I did catch up with the surging woman. Some faintly distressing urban hills followed, and I plodded on until I realised that the end must be near, and pushed a little beyond the 6:30 pace that I had entirely inadvertently and consistently maintained. I finished a couple of seconds behind the woman I had pitched in behind optimistically at the start. She was obviously a keeper. The finish area was magnificent: bananas, endless choices of drink, bagels, cookies ... not sure about the pizza though. There was no queue at the massage tables. Everything seemed to be working too: nothing bleeding or broken. The masseuse was a little disturbed by the state of my neck and shoulders, which had little to do with running. The results were being pinned up, as they came out of the computer, on a noticeboard in the sports arena. I was 62nd (out of about 2400), with a time of 64:41. Not too disappointing for a middle-aged fat runner. Six months ago I would have been pleased with that as a tempo run. The bananas were good too. Heading for more water I bumped into Tim and scored a lift back to Dean & Maurie's with Tim's friend Greg, in the backseat of a SUV with running gear, golfballs, a baseball glove, a child seat and no doubt other sports equipment buried and ready for the weekend. I will wear the pink and lilac finishing shirt ("what kind of man is going to wear that?" 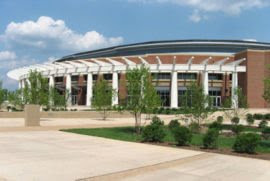 I overheard a female UVa student ask outside the arena) with some satisfaction. Unless someone else wants it? Lesson: running slowly is ok, and race whenever you can, because, even when it seems like you're one too many mornings and a thousand miles behind, things may very well be fine. And this is a race worth doing if you're ever in town. PS: check out the ragged mountain running shop for races in Charlottesville; and it's a good place to buy shoes too.